Different. Fresh. I like it. 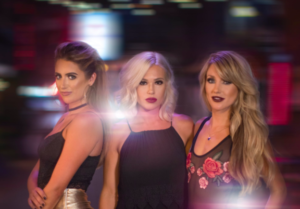 Post Monroe is one of a few new female acts on the country music scene. We’ve looked at this trio before. I think it was right at the end of last year. And it looks like they’ve been out on the grind working and hustling all year. Recently they put out a couple new songs. And the one that seems to be getting the most attention is this one. It’s really good. I think you’ll like it. The more I listen to this one the more I like it. It’s growing on me and I’m for sure adding it to my work playlist. I can’t really say entirely what it is about this song, but it’s got that groove and melodies that make you want to listen on repeat. The song plays on the hook that this girl is all about this one guy. She knows there are others out there, but when she’s with her guy all those others don’t really stand out. They’re just background noise. White noise. Nothing as clear as the guy she’s with. That’s what’s going on with the lyrics, but I think the main story here is the sound. Very fresh and progressive. It’s got like dance kind of thing going on. And I don’t want to say dark or anything like that, but it does have this something going on that makes it sound different. And I like that. They’re trying something new to see if the country fans out there will like it.